American Democratic Support to Ghana's Fourth Republic: Assistance or Encumbrance? ABSTRACT: The end of the Cold War ushered the world into a new era of democratic governance. Citizens in developing countries began to actively contribute to the democratic process, by demanding probity and accountability in existing governance structures. The international donor community added to these efforts by responding to the challenge of the new wave of democratisation in the late 1980s, by embracing �democracy assistance' as a core priority. In January 1993, Ghana inaugurated its Fourth Republic. It was a transition fraught with challenges - which continue to blight the development of a democratic culture. In response, the American Government stepped in with financial and technical support in the hope of helping Ghana to avoid a stall in the county's democratic development. This aid for democratic development has received plenty of criticism with regard to issues such as as conditionalities imposed by America. The current study used a matched-area comparison to examine the effects of aid programmes. The findings show that the USAID-initiated ECSELL and GAIT programmes have increased local-level democratisation in Ghana by strengthening the capacities and abilities of civil society. ABSTRACT: This paper analyses typical situations which exist before and after an election. First, the incumbent and his or her challenger make choices that affect the election results. Second, the election itself determines who wins. Third, the loser may or may not accept defeat. If the defeat is not accepted, either a standoff or a coalition between the incumbent and challenger follows. We assume that the incumbent directs his or her resources into the following activities, which affect the chance of winning an election: production, fighting with the challenger, and providing public goods. Similarly, the challenger directs his or her resources into production and fighting with the incumbent. We examine six possible election outcomes based on whether the incumbent wins, the challenger wins, and whether a standoff or coalition arises after either one of the players wins. We draw conclusions about the effect of the various choices which the incumbent and challenger make. 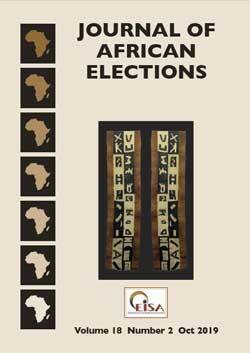 Our analysis is mapped to and tested against empirical data from 51 African elections held between 2006 and 2011 (including one in Eritrea in 1993), which are classified into the six outcomes. A variety of regression results are determined. For example, the current empirical material shows that the election outcome depends crucially on fighting between the incumbent and challenger, and less on public goods provision to the population. Richard Weisfelder is Professor (retired) in the Department of Political Science at the University of Toledo. ABSTRACT: Since 1993, Lesotho has had six free elections. Five have been followed by episodes of coercive regional diplomacy or military intervention to maintain order or sustain the elected government. Two of these interventions have occurred as Lesotho's electoral system was being transformed from a firstpast-the-post dominant party system to a mixed member proportional pattern, and a third intervention is presently underway. This essay contends that the effort to remedy the prior lack of inclusiveness in Parliament has accentuated the fissiparous proclivities within Lesotho's political culture. Following the 2012 and 2015 elections, greater fragmentation among political parties led to hung parliaments and coalition governments with minimal parliamentary majorities. This essay questions whether Staffan Lindberg's conceptual model regarding the link between the consolidation of democracy and the experience of successive free and fair elections can adequately explain Lesotho's trajectory. Remarkably, the transfers of power by Pakalitha Mosisili to Motsoahae Thomas Thabane in 2012, and by Thabane back to Mosisili in 2015, were the first such exchanges between an incumbent government and an opposition party in southern Africa during the post-liberation era. Whether this positive development might be translated into more effective governance and regard for democratic norms will be explored. Tlohang W Letsie is a PhD candidate in the Peacebuilding Programme at the Department of Public Management and Economics, Durban University of Technology, South Africa. ABSTRACT: Within just two years of its existence, Lesotho's first coalition government experienced serious internal conflicts. These conflicts were mainly the result of the coalition leaders' failure to balance coalition agreements against the country's Constitution. The conflicts paralysed the government and the National Assembly, and polarised security establishments. These political developments required mediation by the Southern African Development Community (SADC), which in turn led to holding �snap elections' in February 2015. This paper discusses the snap elections. Although the elections helped to form and legitimise a new coalition government, they did not resolve the structural challenges that had paralysed the first coalition government. By calling for an early election, SADC mediation failed to prioritise a solution to the security crisis in Lesotho. Security agencies remain polarised, and some politicians have aligned themselves with those agencies to enhance their influence in national politics. The paper concludes that the snap elections provided only a short-term solution to Lesotho's political and security problems. The new coalition government is likely to experience the same fate as its predecessor. Furthermore, rule of law is likely to be compromised by the new coalition government for the sake of internal stability. Bontle Masilo is a lecturer in the Department of Political and Administrative Studies at the University of Botswana. Batlang Seabo is a lecturer in the Department of Political and Administrative Studies at the University of Botswana. ABSTRACT: Political candidates and parties harnessed Facebook as a tool for political mobilisation and communication at the time of the Botswana 2014 election. This paper explores the use of Facebook as a campaign tool in the 2014 Botswana general election. It argues that the extensive use of Facebook in political campaigning has added a new dimension to electoral campaigns in Botswana, by allowing political parties a relatively cheap means of transmitting information. Furthermore, Facebook has democratised media access, and has afforded people who have previously been side-lined by traditional media an important platform for political mobilization. Accordingly, Facebook has widened the democratic space and reduced the disparities in the electoral arena. Most importantly, it has generated interest in politics among young people. The intersection between Facebook and traditional media and other social media has augmented their efficiency by amplifying their reach. However, Facebook does not replace traditional campaign approaches but rather serves to augment them. Eric S McLaughlin is a lecturer at the Department of Political Science University of Redlands, California. ABSTRACT: While many studies have probed the relationship between ethnic diversity and voter turnout, few have examined how voter turnout might be influenced by state policies that afford ethnic groups differing levels of official recognition. This study draws on theories at the intersection of political science and sociolinguistics, to develop and test an argument about the effect that language recognition practices in multilingual democratic societies have on voter turnout. Using data from South Africa, the study finds evidence that inclusive language recognition is linked to higher turnout rates for targeted groups. The study utilises aggregate data collected at ward level, but assesses the results in a preliminary fashion with individual-level data from Afrobarometer. Nigeria's Fourth Republic (1999-2015) and Electoral Outcomes: How Long can Patronage or �Politics of the Belly' Last? ABSTRACT: The relationship between elections and the vitality of a democratic society is clear. Elections have proven to be the best means of strengthening the mandate of a performing administration or removing a non-performing one. This paper argues, however, that the outcomes of several elections in Nigeria's Fourth Republic have proved contrary to the common trend in most advanced democratic systems, in which electoral outcomes are based on performance. While in some cases, especially in political party primaries, candidates with little or no democratic credentials have emerged during general elections, in other instances administrations with relatively high records of infrastructural development have been voted out. This study traces the most probable causes of this paradox to Nigeria's money politics and a possible misinterpretation of the concept of development. It is essentially a literature-based study, descriptive but also analytical. The paper concludes that the country will have to contend with the politics of underdevelopment for as long as immediate and pecuniary benefits constitute the expectation of the generality of followers. Mojeed Adekunle Animashaun is a lecturer and Head of Department in the Department of Political Science and Public Administration at Fountain University, Osogbo, Nigeria. ABSTRACT: Nigeria's 2015 presidential election has been a landmark in the country's political history. As the fifth round of elections since the restoration of constitutional rule in 1999, it not only resulted in an alternation of power for the first time in the democratic history of Africa's largest democracy, but its outcome is widely acknowledged as substantially reflecting the wishes of the electorate. This paper reviews the 2015 presidential contest in Nigeria. It observes that, while the election conferred broad legitimacy on the post-election regime, the expectations that accompany the electoral outcome are a huge challenge for the Buhari administration. The paper identifies some factors that may challenge the aspirations of the new government. It also identifies useful lessons that can be drawn from the outcome of the election. These lessons have implications not only for the management of future elections but, more importantly, for efforts at deepening democratic rule in Nigeria.